Some followers of The Golden K blog may know that I have another blog called Golden Kali. 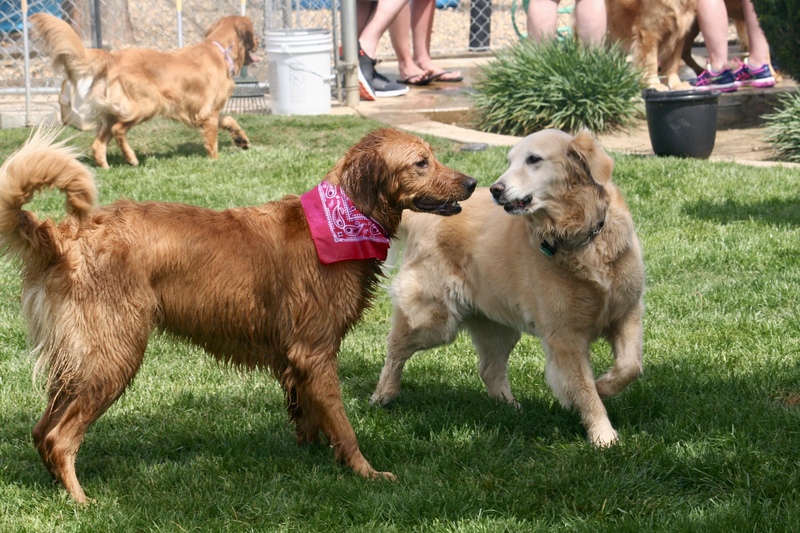 The Golden Kali blog began the day after Kali, a rescue from Taiwan and joined our pack. The Golden K blog started shortly after relocating to the mountains a year ago. The lines between the two blog sites have blurred because we wouldn’t have The Golden K without our Golden Kali and her sister Kloe. The tag line for the Golden Kali blog used to be “Kali’s new life in America”. When we moved to the mountains the tag line changed to, “Kali’s new life in the mountains. The tag line (I’m a big fan of tag lines) for The Golden K is, “A romantic perspective of life at 3100 feet”. I can’t think of Kali and Kloe without thinking about how lucky they are, we all are, to be living on five acres of paradise in the mountains. And I can’t think of the Golden K without thinking about Kali and Kloe and how the Golden K would not be so Golden without them and it certainly would not be called the Golden K. Maybe the Iron Ranch, or Silver Spurs, but not the Golden K.
Golden Kali on the right and “little” sister Kloe on the left. We love both blogs and both dogs. They are just adorable and reading about their lives is such a treat.